Over the past year, as a side project, I participated in the AIGA Chicago Mentorship Program this past spring. It was a great way to meet other designers like myself in the local design community and flex my creative muscles outside of my typical design job. I created a group project with a team of 8 other individuals. When we started, there were no rules as to what the project could turn into. We only had a few limitations, which were money ($50 per person) and time (8 weeks). 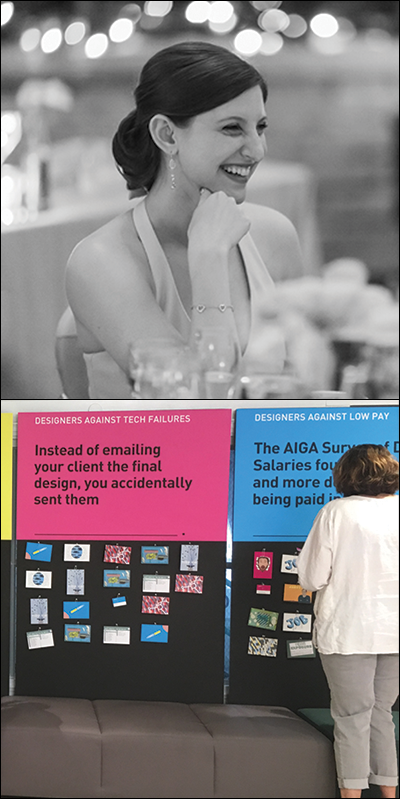 We came up with an interactive game called Designers Against Humanity, playing into the idea that all designers have shared frustrations with their clients, work and careers. Players received 3 answer cards when they walked in the door. After they entered the room, they found a wall of 5 prompts, with postcards that we designed to relate underneath. Players were encourage to swap an answer for a postcard, and the best answers at the end of the night won a prize. It fostered conversations and helped to build deeper connections throughout the group of people who interacted with it. Another side project I have is sitting on the Alumni Leadership Board of Camp Kesem, a nonprofit that operates free summer camps for children who have been touched by a parent’s cancer. While I was a student at George Washington University, I helped to found a local chapter of Camp Kesem. Now I continue to stay involved as an alumni through offering my design skills, fundraising and providing general advice whenever it’s needed. I also have lots of other fun small side projects that I make for myself or for friends! You can see more of my personal projects on my website. I think it’s really important to set concrete goals for yourself. When I was working on my group project for the AIGA Mentorship Program, I knew that I had to create 5 postcards by a certain date or they wouldn’t get printed in time for the wrap-up party. When setting concrete goals, be as specific as possible and give yourself incremental due dates for when you want to achieve those goals. That way, you will have to live up to your own expectations that you set for yourself, and you have nobody else to blame if you don’t achieve what you wanted to. For me, it is very important to have a side project to express my own creativity. Sometimes as a designer, you get bogged down in what clients want and you start to lose your sense of self. It is really refreshing to take a break from my normal, day-to-day design work and create something completely different and unique. The best part is that you don’t have any client to answer to, you just have to answer to yourself! It’s also an opportunity to teach yourself something new. Learning new skills through side projects will help you to become a stronger designer as a whole, and you will be able to bring your new skills to your full-time job. Diptych courtesy of Rebecca MacDonald.